Exploring identity, sexuality and religion from the eyes of a Black teenage Instagram celebrity, join the cast and crew of Nijla Mu’min’s debut feature film Jinn for a conversation on the elements behind the production, style, and cultural context for the crafting of this remarkable story. Confirmed panelists include: writer/director Nijla Mu’min, director of photography Bruce Francis Cole, and producer Avril Speaks. 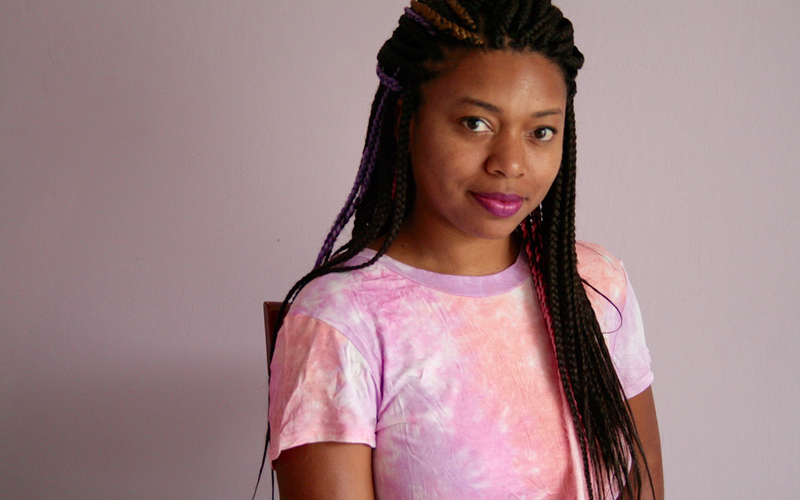 Nijla Mu’min is a writer and filmmaker from the East Bay Area. Named one of 25 New Faces of Independent Film by Filmmaker Magazine in 2017, she tells stories about black girls and women who find themselves between worlds and identities.Her short films have screened at festivals and venues across the country, including Outfest, Pan African Film Festival, and BAMcinématek. Her filmmaking and screenwriting have been supported by the Sundance Institute, IFP, Film Independent, the Islamic Scholarship Fund, Women In Film LA, and the Princess Grace Foundation. In 2014, she was selected for the Sundance Institute Screenwriters Intensive, and she was the winner of the Grand Jury Prize for Best Screenplay at the 2014 Urbanworld Film Festival, for her script Noor. She was selected as the first-prize winner of the 2016 Islamic Scholarship Fund’s Film Grant, and in 2017, her film Jinn was selected for IFP’s Narrative Lab and as a recipient of SFFILM’s Rainin Film Grant. In July, Nijla attended the 2017 Sundance Institute Sound and Music Design Lab at Skywalker Ranch for Jinn. Her short film Dream was acquired by Issa Rae Productions (“Insecure,” HBO) for online streaming in 2017, and has amassed over 70,000 views to date. Her debut feature film, Jinn, starring Zoe Renee and Simone Missick (Netflix’s “Luke Cage”), premiered in narrative competition at the 2018 SXSW Film Festival, where she won the Special Jury Recognition Award for screenwriting. In 2018, she joined the all-female directorial team of Ava DuVernay’s critically-acclaimed television series “Queen Sugar,” for season three. In June, she won the Best Screenplay award for Jinn at the 2018 American Black Film Festival (ABFF). She is a 2013 dual-degree graduate of CalArts MFA Film Directing and Writing Programs. Her writing appears in VICE, Shadow and Act, The East Bay Express, and The Los Angeles Times. Bruce Francis Cole is a cinematographer who lives in both NY and LA and works globally. Early in his childhood he was an exceptional student in the form of visual art. Raised in the inner-city, his art carried him to places beyond his immediate surroundings. After traveling around America working for non-profit social justice programs and inspired by the late Haskell Wexler, he decided to explore film as an art form for social change. Eventually after studying cinematography at both The North Carolina School of Art and The American Film Institute, he worked his way up from electrician to gaffer and eventually DP. Avril Speaks was an Associate Producer on the TNT docu-series American Race, and is the lead producer on the feature film Jinn, which premiered in Narrative Competition at SXSW in 2018 and won Special Jury Recognition for Writing. She is currently one of the producers for the upcoming feature film, Hosea, while preparing to produce Easmanie Michel’s film Caroline’s Wedding, based on the short story by Haitian-American writer Edwidge Danticat. She is a Film Independent Producing Lab Fellow for the project Noor, and a winner of the 2018 Movie Magic Producer Award. She most recently worked as a Production Manager for Scripted Programming at BET Networks. Avril earned her M.F.A. in Film Directing from Columbia University School of the Arts in New York City and was a film professor at Howard University before moving to Los Angeles. She earned a second Masters in Theology and Film before deciding to leave academia to focus primarily on producing and directing. She has directed two feature films The Round Table, and the award-winning film Sophisticated Romance. For more information, visit azuspeak.com. To capture the scope of her work, Nehad considers herself to be a cultural historian. She is a Philly based and blessed filmmaker, curator, editor, and writer. Trained in media and literature by Black and Palestinian creators, Nehad believes in art that carries aesthetic excellence as well as social and political significance. She is a 2017 Leeway Transformation Award winner, and her film Unbowed (in production) has been selected for the 2018 Tribeca Film Institute and the inaugural Palestine Pavilion at the 2018 Cannes Film Festival.